Trading arms with Israel makes the UK complicit in Israel’s continuing violations of human rights and international law. The Israeli assault on Gaza in July-August 2014, in which 2,205 Palestinians (including 521 children) were killed, was only one example of Israel’s indiscriminate acts of violence against the Palestinian people. 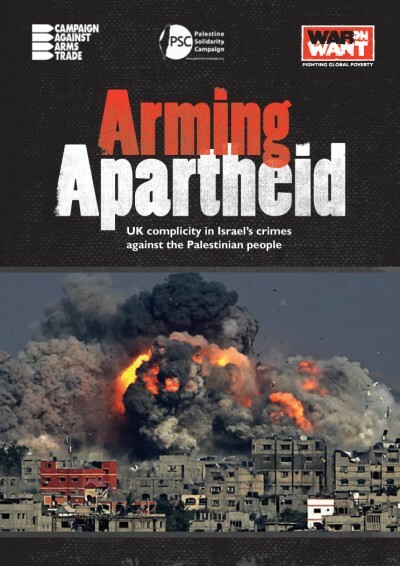 Yet UK-made weapons and military technologies continue to be sold to and used by the occupying Israeli forces. …and should take into account the buyer country’s “respect for international law”. If the government’s own export guidelines were properly applied, the result would be a de facto embargo on arms exports to Israel. The UK’s Watchkeeper surveillance drone has been developed under a £1 billion joint venture contract awarded by the Ministry of Defence to Thales UK and Israel’s Elbit Systems, allowing the UK military to benefit from technologies that have been ‘field tested’ on the occupied Palestinians. At the same time, the UK imports Israeli military hardware and components and also provides training, in the UK, for Israeli military personnel. This means that when the UK imports Israeli arms, it is helping Israel benefit from unlawful practices.